Check out our Sales Page for great savings and featured products. Call for help and special offers. 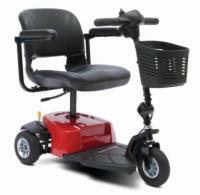 Our vehicle lifts and carriers for manual wheelchairs are lightweight, compact, and easy to install. Please note that these lifts do not have the weight capacity to handle a powered wheelchair or mobility scooter - if you need a lift or carrier for these devices, please visit our main vehicle lift page to find something more suitable for your needs. Check "Compare" on the products you are interested in and then click "Compare Selected Products" to see a side by side comparison. The Tilt N Tote Wheelchair Lift lets you transport a manual wheelchair economically and conveniently on the back of your vehicle. 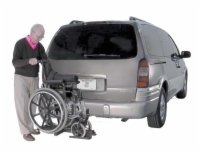 Harmar's motorized lift for manual wheelchairs makes transporting them a snap. What's more, both the platform and hold down arm fold up when not in use.